A town built around 1913 for lumber production by the Pickering Lumber Company, the name honored Will Haslam, the company’s general manager. Residential housing was segregated but many of the workers lived outside the mill grounds. The community was granted a post office in 1914. It is said that the mill ran day and night – stopping only for meals. The near-constant production hastened the town’s decline. The population was reported at around 250 residents from the 1920s through the 1940s. It peaked in the early 1950s with a count of 300 but even then the trees were being depleted to the point that the end was in sight. The mill closed and Haslam lost its post office in the mid 1950s. By the mid 1960s only 40 people remained. The construction of Toledo Bend Reservoir gave the town a push upward in the late 1960s, and the population was estimated at around 100 through 1990. 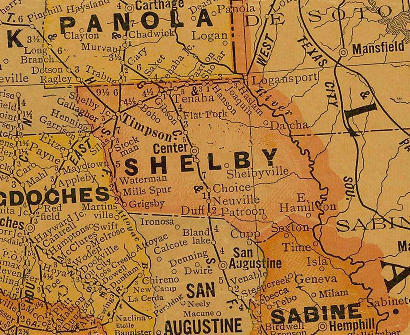 (Above "B" in "SHELBY" - NE of Center"